He was remanded in custody, as was businessman Philip Arps, on charges of supplying or distributing objectionable material. The crime carries a maximum penalty of 14 years imprisonment. 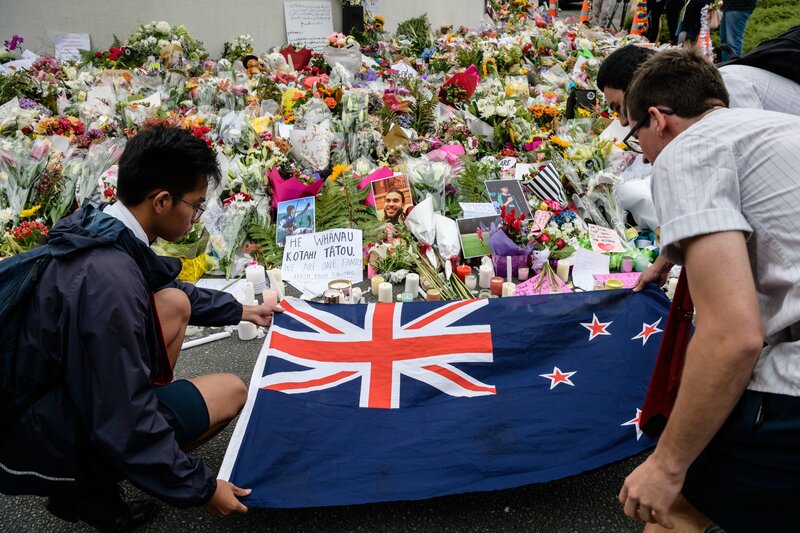 Students display the New Zealand national flag next to flowers during a vigil in Christchurch on March 18, 2019. A man has appeared in court charged with illegally hree days after a shooting incident at two mosques in the city that claimed the lives of 50 Muslim worshippers. ANTHONY WALLACE/AFP/Getty Images Four other unnamed individuals also appeared in Christchurch District Court on Monday, although none are in custody. The original footage was broadcast live on Facebook for 17 minutes, and remained up for an hour afterward. The video was then re-uploaded successfully to the social media site more than 1.5 million times, Stuff reported. New Zealand’s Privacy Commissioner John Edwards said Facebook “cannot be trusted,” and also described them as “morally bankrupt pathological liars,” in a tweet he later deleted. New Zealand’s chief censor has banned both the live streamed footage of the attack and the manifesto written and released by self-confessed white supremacist Brenton Harrison Tarrant, who faces 50 murder charges and 39 attempted murder charges for the attacks on March 15. Facebook executive Guy Rosen said that the video was viewed fewer than 200 times, and during the attacks the service “did not get a single user report,” (via CBS). Facebook’s policy director Brian Fisherman told Congress that it failed to detect the live stream because there was “not enough gore” in the video for their algorithm to catch it, according to Newshub. In neighboring Australia, tough new restrictions on social media giants have been legislated for, and could result in big fines and possible jail terms if websites do not act fast enough to remove terrorist or objectionable footage from their platforms, Stuff reported. The Sydney Morning Herald reported that Facebook will stop users from posting live videos if they have previously broken the company’s community guidelines, an idea first mooted by Facebook COO Sheryl Sandberg. Facebook said in a blog post it would be impractical to impose a time delay on live videos as it would “further slow down” the reporting and review of harmful videos, as well as delaying first responders.